We've heard a lot of talk about Sheldon's Meemaw over the years, but we never really knew what she was like. 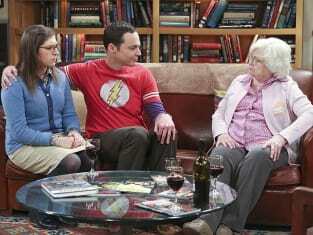 On The Big Bang Theory Season 9 Episode 14 we finally get the chance to meet the infamous Meemaw, and she's absolutely wonderful. Seriously, can we please see more of Meemaw in the future?! The Big Bang Theory Photos from "The Meemaw Materialization"
Of course, the first words we hear out of Meemaw's mouth are "Moon Pie!" Sheldon is thrilled, and Leonard likes her right away when she criticizes Sheldon for insulting him. Oh, now you call her Constance. I call her Meemaw. You have your own Meemaw. It's not my fault she died when you were four. Right off the bat, Meemaw seems pretty great. She knows exactly how to talk to Sheldon, and she's the only person we've ever seen be allowed to sit in Sheldon's spot. But when she meets Amy, she lays into her as soon as they get time alone. She seems harsh, but the bottom line is that she knows things are serious with Amy and Sheldon, and she doesn't want to see her grandson get hurt again. You really couldn't expect anything else. The fact that Amy sticks up for herself may put Meemaw off a bit at first, but it's also a contributing factor as to why she finally accepts her. They end up having an important heart to heart, where we learn that Sheldon's grandpa may have actually been a little like him. She stood by him and helped him to be a better person, and that's what she wants Sheldon to have too. 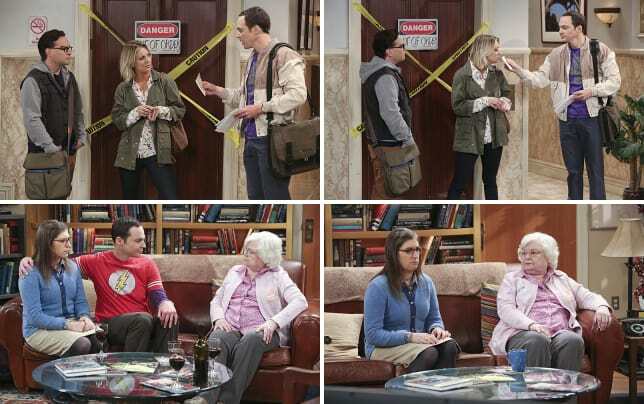 Sheldon makes a bold move of his own when he takes Amy's side and defends her against Meemaw. As usual, he doesn't exactly say the right thing, but the sentiment is there at least. Some of it may be subtle, but Meemaw's visit does some important things for Sheldon and Amy's relationship. Amy also knows now that there's a ring, but it looks like it may be a while before she actually gets it. I just gave you my virginity, woman. Cool your jets! Permalink: I just gave you my virginity, woman. Cool your jets! One of my favorite moments in this episode is when Amy asks why Meemaw calls Sheldon "Moon Pie" and Leonard and Penny are able to quote the answer in unison. She could just eat him up! I like the idea of Raj having another love interest of sorts, but I don't think he'll be ending things with crazy Emily any time soon. As much as I enjoyed watching this episode, I'm ready to see more focus on Leonard and Penny. They've both been sidelined a lot, it seems. What did you think of "The Meemaw Materialization"? Share your thoughts in the comments below! Penny: You know, the last time I got a handwritten letter was from someone who told me I parked like a blind person. Leonard: That someone has a name. Permalink: That someone has a name. 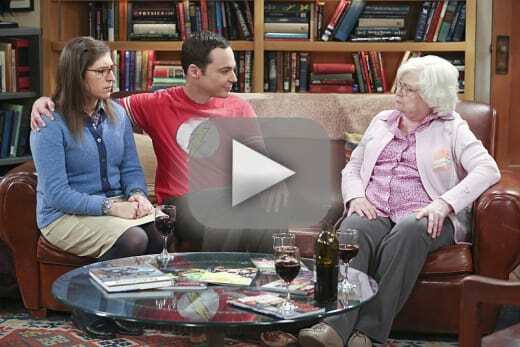 The Big Bang Theory Photo Preview: Meet Meemaw!